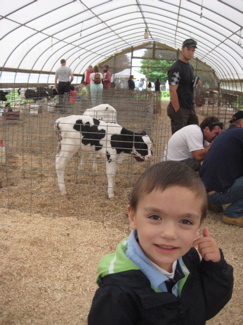 Mapleleaf Farm is part of the wonderful Farmer’s Cow. 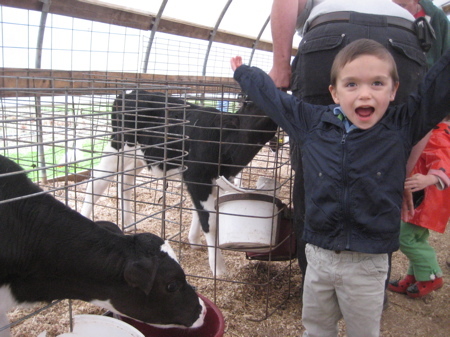 The Farmer’s Cow is a group of six Connecticut family dairy farms working for the future of our families and dairy businesses. 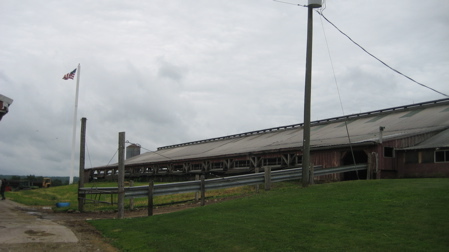 They produce milk, half and half, eggs and seasonal beverages. 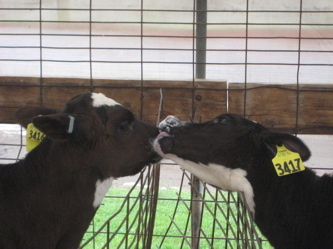 I’ll plop that blurb at the top of each Farmer’s Cow farm visit. 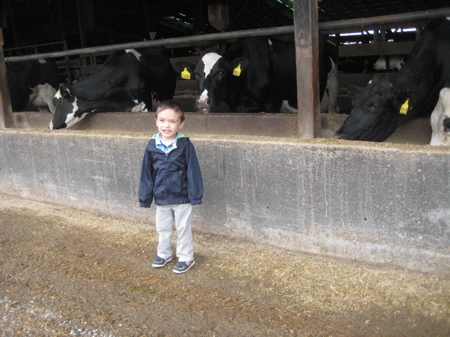 As there are six Farmer’s Cow farms, this visit marked our halfway point. While I was certainly beginning to see some redundancy with the farms, I’m the guy hiking very similar hikes and visiting very similar museums all the time; I can’t exactly complain. And besides, there’s nothing to complain about anyway. 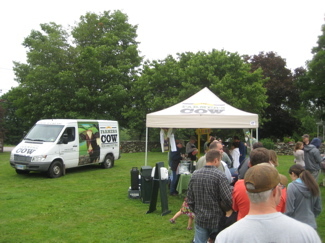 These excellent Farmer’s Cow events are FREE and they give you FREE ice cream and drinks. That alone makes it worth driving to each of the six farms when they have these open houses once per year. Well, that and if you’re the sole author of a website seeking to do everything there is to do in Connecticut. Mapleleaf had a very nice and clean barn positively filled with baby cows as well as some goats and roaming chickens. 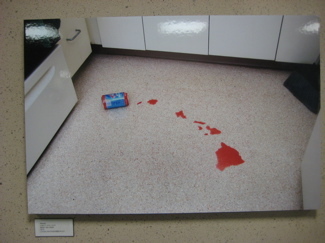 Really, if I was a good photographer with a good camera, I’d have some really great shots of this area. 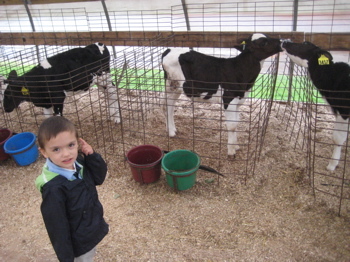 Damian has always loved cows for some reason so he (and every other kid as far as I could tell) enjoyed this area for a long time. 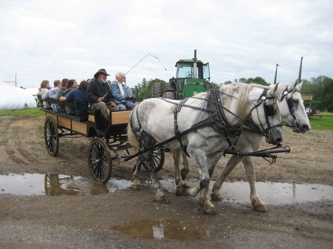 Of course, he still hates things like horse-drawn hay rides so that was (again) not going to happen for us. 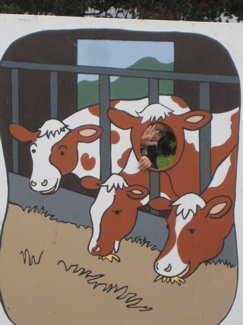 (Nor at the next two Farmer’s Cow farms we went to in 2011.) But no matter, I’m not such a fan of them either. We are all fans of ice cream, that’s for sure and like I said, this event had the longest line for ice cream of any I’ve seen. To the Farmer’s Cow credit, even though we were getting our treats mere minutes before the end of the open house, they still had ample supply and didn’t run out. This is just a great organization and I’m proud to say I’ve become (virtual) friends with some of the fine folks involved with it. I’m also proud to say that as I’m writing this randomly on Super Bowl Sunday 2012, I have a pint of Farmer’s Cow Chocolate Mint Chip in my freezer. If you’re gonna get fat, get fat local! 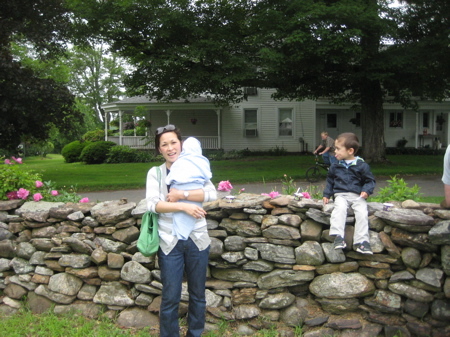 After the ice cream and more photo opportunities sitting on a stone wall, Damian insisted on traveling back through the “showcase” animal area one more time. Who can say no to that face? And who can say no to learning more about Mapleleaf Farm? Not I. Since the mid 1700’s farming has been a way of life for the Ellis family. After moving from several farm sites within the Town of Hebron, Ned Ellis’ great grandfather purchased the present farm in the Gilead section of town in 1903. While dedication to the land has not changed, farming methods have progressed dramatically in 100 years. The Ellises constructed new facilities and have expanded their dairy operation to 210 milking Holstein cows and 190 non-milking young heifers. 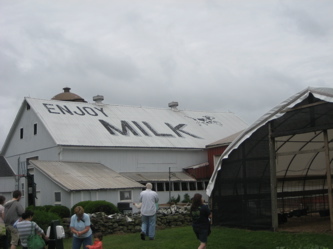 The barn roof at Mapleleaf Farm Inc. proclaims, “Enjoy milk!” for a good reason: the farm produces over 4.9 million pounds of milk annually, averaging more than 8 gallons per cow each day. To help protect farmland in central Connecticut forever, Mapleleaf Farm has recently sold development rights to the State of Connecticut on 250 areas of land and purchased 175 acres of protected farmland. Currently the farm grows 275 acres of corn, 90 acres of alfalfa and 50 acres of grass to feed its cows throughout the year. Mapleleaf hosts many visitors, young and old, each year. We skipped the tour this time due to having the baby with us, but from what I could tell, Mapleleaf is a well-run and impressive family farm.